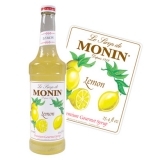 Monin Pink Grapefruit (Pamplemousse Rose in French) syrup in a stylish 70cl glass bottle. Monin is always eager to make you taste new exotic flavours, we would like you to discover the Monin Pink Grapefruit syrup. Crunchy and juicy, the flesh of Pink Grapefruit is famous for its sweet, fruity and fragrant flavour. Just slightly acidic and remarkably powerful aroma, Monin Pink Grapefruit will let you see the world in pink! Applications: Smoothies, martinis, fruit cocktails, fruit punches and teas. Sugar, water, acidifying agent: citric acid, flavouring, emulsifier: acacia gum, colouring agent: E129. Total pink grapefruit juice: 7%.